August is almost here (unbelievable, I know). So it’s time to talk August Pinterest trends. Every month, I tell you what to be pinning that month. Why do I do that? Because Pinterest is very search-based, according to seasons and months, so you want to be tapping into that so that you can capture that search traffic at its peak. Remember, you can sign up for my Wednesday email that includes all my insider tips, some snips of my personal life, and resources to help you build your business. And if you sign up, you’ll get a free Pinterest planner! Today we’re talking about what to pin in August. Back to school is HUGE this time of year. School supply season is in full swing. Target and Walmart are well stocked as I’m recording this. Fall fashion (think scarves, boots, jeans!) is making a comeback. People are starting to plan tailgating trips to football games. Grilling recipes are great for those tailgating events as well. After enjoying the summer and relaxation, people are gearing up to be productive. Planning and organization are great topics to post about as people get back into a routine. For me, August is a month when I start to feel ready to get back into a steady routine. Lazy days are great, but I get itchy for a daily routine. Camping is still a hot topic. Here in the Pacific Northwest, lots of people take camping trips over Labor Day. Think about what camping tips you have to offer. DIYers who make your own Halloween costumes, this is your time! Post all your Halloween tips and tricks, whether that’s costumes, cheap candy, or ways to decorate. I highly recommend promoting those camping-related posts. If you have posts that highlight camping products using affiliate links, get them circulating now. People really enjoy camping while the weather is fairly warm and nice, so take advantage of that. In July and August, more people are searching home organization ideas. I said it before, but people are really getting ready to get back into the swing of a routine. Serve up content that is directed specifically to your avatar and that you know will get traffic. Increase those conversions, whatever they might be. Need help with promoted pins? Check out our Complete Guide to Promoted Pins. This is my favorite section! I love content planning ideas. There are a few topics I’d love for you to be thinking about over the next few months. There are a lot of holidays at the end of the year — Halloween, Thanksgiving, Christmas (also, lots of parties and general busyness). Sometimes work gets pushed to the side as the year comes to a close. My suggestion is to spend some time now getting a plan together for November and December, while still working on August and September. Fall, fall, fall. Think cinnamon, pumpkin spice, apples, leaves. Brainstorm some new spins on those general themes. How about ten great books to cozy up on the couch with? If you turn that into a pin, send it to me and I’d love to pin it for you! Think about weddings. Chances are people who are getting married in the fall already have their weddings planned out. So if you have any last minute tips, those would be great. But also, people who are getting married next spring or summer are searching now. So think about what kind of wedding pins you can create to target that audience. Thanksgiving and Halloween are HUGE. Food bloggers, put forward your best effort for Thanksgiving meals and it’ll pay off the week of Thanksgiving. Think about the boards you’re going to create and pin to. Pinterest wants boards that aren’t so broad. Let’s take Thanksgiving for example. If you’re a paleo food blogger, create a Thanksgiving paleo side dish board. That is very specific. Be thinking about your board names and how specific and narrow you can be. Have a plan to be pinning to that specific board consistently. Identify what’s being pinned from your site by going to Pinterest.com/source/(insert your website URL here). One of the reasons you’ll want to check this out is to see who is pinning your pins, what type of images are being pinned, and if the pin description is traveling correctly with the pin. Make sure those pieces are “super-optimized” on your site. If you don’t have time to check this out for yourself, have a virtual assistant do it for you, or set an hour aside using a Google sheet to make a to-do list as you work your way through. Find out how long the to-do list will take to complete, and then take action. Create more opportunities to monetize content by updating links on your previous holiday posts with articles published during the current calendar year. Monetization is so important. 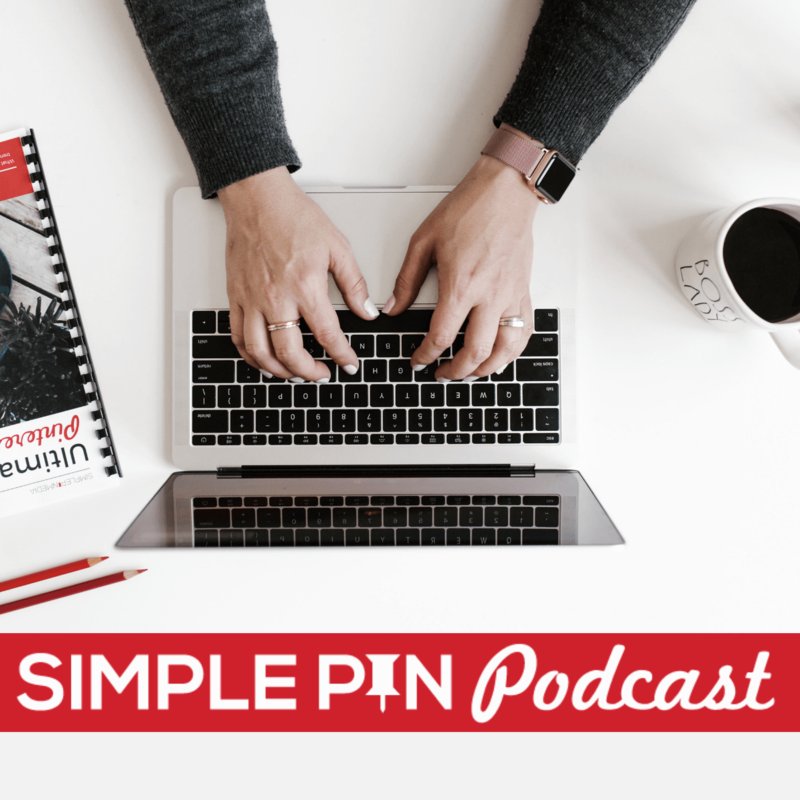 We have a great podcast episode about monetizing Pinterest traffic. Go listen to that podcast episode because all the tips are great. Think about what did well last year and how you can go in and add more links. As a content creator, I have a hundred and some posts on Simple Pin and have to go back and update them at times. This helps the reader, but also Google knows it’s being updated and isn’t out of date. I set a timer for 30 minutes whenever I need to do updating and just get in the trenches of updating all the links. Most of the time, it’s just small tweaks that need to be made. Updating your content is a constant chore that needs doing. Again, if you haven’t signed up for the Pinterest planner I created with Tailwind, go sign up for the Wednesday email and get it. I hope you come to join my email party!